Topics: Mission, Why Choose Us, Affiliations, Commercial, and Residential. 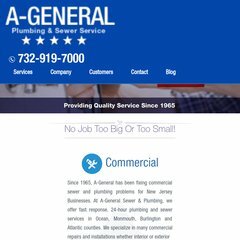 a-general.com A-General Plumbing and Sewer Service - Ocean County, Monmouth ..
a-general.com Plumbing Repairs, Sewer & Drain Cleaning, Video Pipe Inspection ..
a-general.com Commercial Sewer & Plumbing Services: Industrial Plumbing service ..
a-general.com Contact A-General for Your Commercial & Residential Plumbing .. It has 3 DNS records, ns2.aosware.com, ns3.aosware.com, and ns1.aosware.com. Its IP Number is 173.236.115.10. It is hosted by Singlehop Inc (Illinois, Chicago,) using Apache web server. PING www. (173.236.115.10) 56(84) bytes of data. Pinging the server, resulted in a 16.4 ms response.